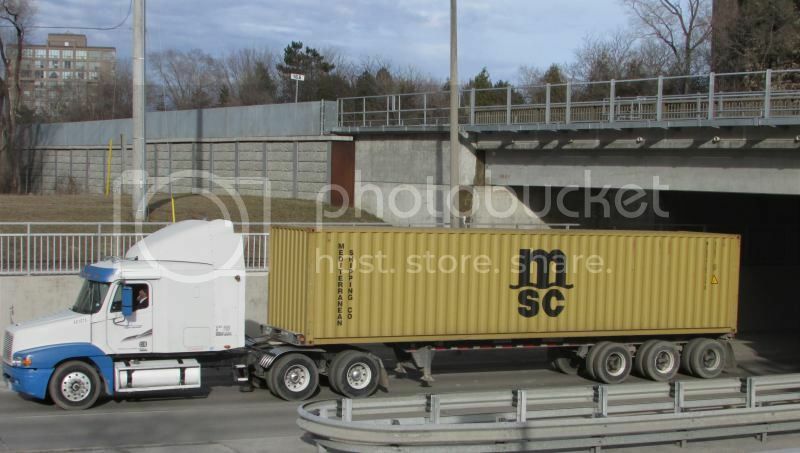 This is the link to my intermodal picture album in Photobucket. 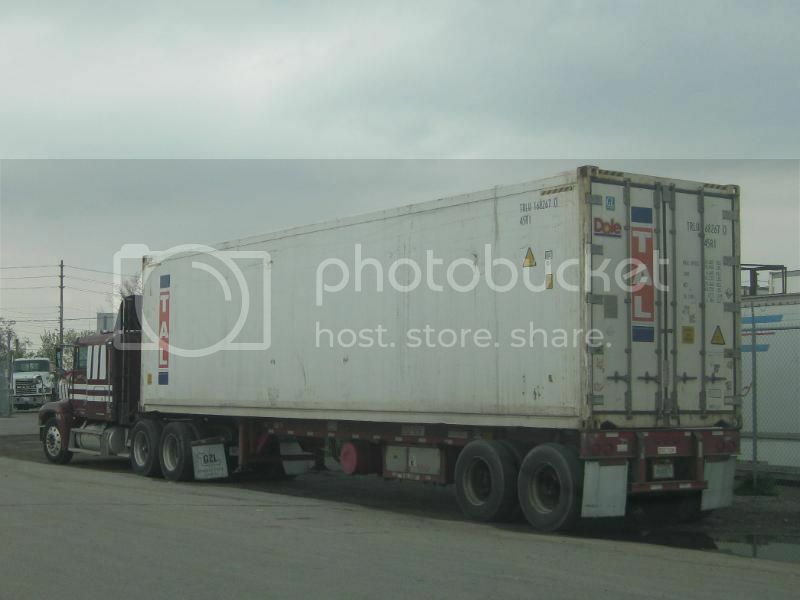 Trucks, Trains and Containers. Fantastic shots as always, Rob! Thanks for sharing this. 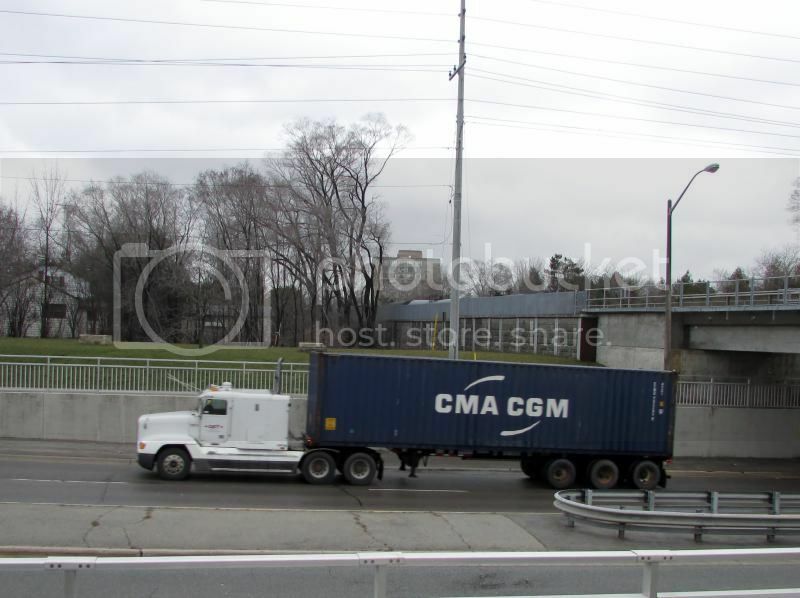 Although I update this album frequently there are new COFC photos of some of the containers on CN Train 148 between Chicago and Toronto added. I chased the train on Sunday afternoon and was able to get some shots at a point called Scotch Block near Milton ON. 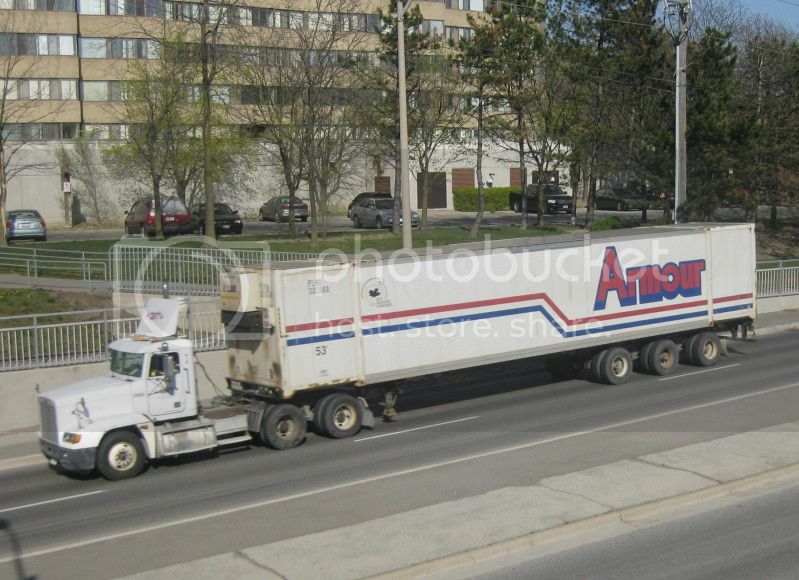 Canada Cartage with a Canadian Tire domestic can on the way to a store. More updates to this Album. Here is one I traced to see where it had been before being dragged up North Queen Street to the MT ANNEX. The MT ANNEX near my wife's workplace is closed and no more (or very few) North Queen Street can haulers. CP has closed it's OBICO yard and shifted all intermodal operations to Bolton. My main local can hauler now is Musket Transport who run mostly Volvo tractors. There are still a variety of beat up Cartage company tractors for local deliveries to be seen. Here is a Musket from Friday morning. A 20 foot dry box is loaded on an adjustable chassis. MSC cans being hauled by local cartage trucks. 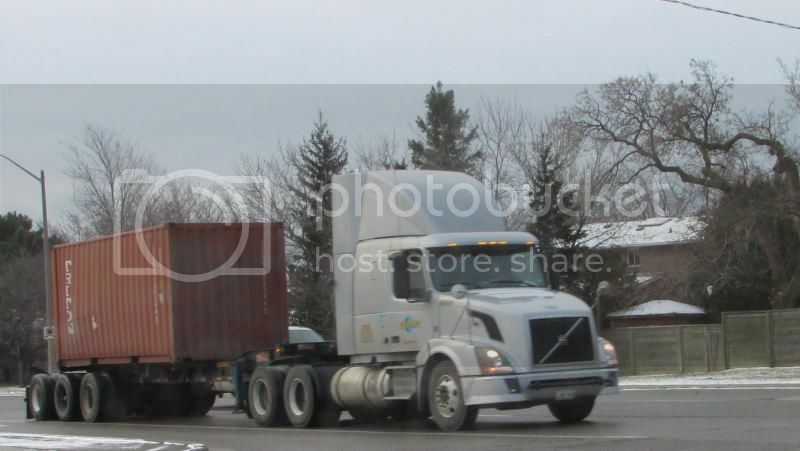 Anyone notice challenger is hauling lots of B train cans lately, with bunk trucks, wonder how far they are going? ^Please try to snap some photos if possible! Why do Canadians spell T-I-R-E, the American form instead of T-Y-R-E, the British form, and yet spell C-O-L-O-U-R, the British form, instead of C-O-L-O-R, the American form? Well Chuck, good question really..........there are a lot strange things in the English "Canadian" language in spelling and such! Never thought of Tyre before but the others you mentioned and there are more! I just looked it up on Wikipedia, if it has much credibility. Evidently Canadian English borrows some spellings from American and British English. Weird, you could spell a word one way and then walk across a bridge and correctly spell it another way. No different than the American north and American south. LOL! BTW, according to Wikipedia (again credibility), the Aussies do the same thing. Today, people are taught the American spelling of words. However, when I was in grade school in the late 1950's and early 1960's the British heritage was still thought to be important. We were members of the British Commonwealth and, until 1964, flew the Red Ensign as our national flag. We sang GOD SAVE THE QUEEN each morning and then Oh Canada. I was taught that Canadian English had evolved from The Queen's English. You are right - we never spelt tire as TYRE, we never spelt airplane as aeroplane and since we drove mostly American cars (Fords, Dodge, Pontiac etc) never called the Hood the bonnet or the trunk the boot. Over time all the British influences in our culture have disappeared and Great Britain is just another country in the world.